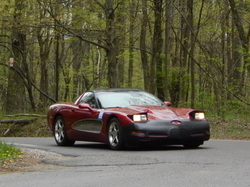 Derby City Corvette Club attended the SCCA Car Club Challenge Rallye along with the Circle City Club on April 27th. . Derby City had 2 cars entered, Circle City had 9, Indy BMW had 9, Miata Club of Indy had 1, Viper club had 1. Circle City Corvette Club Team#2 won the event.It was our first ever TSD type Rallye and we made lots of mistakes but had a great time participating and we will do it again next year..